See our conservation team in action! Click to watch the treatment video. Though Roger Brown was born in Alabama and split his time between homes in Chicago, Michigan, and California, the Windy City always held a special place in his heart. Brown moved to Chicago in 1962 to attend the American Academy of Art, where he completed a commercial design program. Brown then enrolled at the School of the Art Institute of Chicago, where he received his BFA in 1968 and MFA in 1970. During this time, Brown and his colleagues (many of whom would become part of the group known as the Chicago Imagists) began to nurture an appreciation for self-taught artists, seeing them not as “outsider” artists, but as being worthy of respect and inclusion into the mainstream art world. This, coupled with his travels throughout the United States, Africa, Europe, and Russia, had a profound influence on Brown’s art. Though his works are often bright and simple in composition, the artist’s practice frequently presents a darkly satirical view of contemporary life and American culture. Recently, one of Brown’s multimedia pieces came to us with impact and age-related damage that would require a team of collaborative conservators to treat its various components. 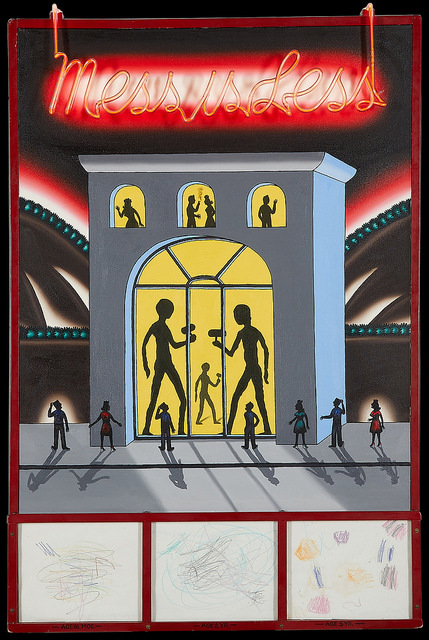 The piece was composed of a painting and three works on paper in a red frame made by Brown himself, with a neon sign spelling out “Mess is Less” attached to both the frame and the painting. Immediately, our conservators knew the repair would have to be a collaborative effort between our Painting, Paper, and Framing Departments. Additionally, the neon component would require enlisting the assistance of one of our trusted specialists to work together with our in-house conservators. As our Painting Department examined the work, they noted the auxiliary support appeared to be original to the piece, and was composed of a strainer with one corner brace. The painting appeared to be executed on a cotton canvas of medium weave and weight. The canvas exhibited two minor deformations at the left and right of the red halo on the outside edges of the piece. The canvas was taut on its support, and there were screws through the support that secured the 3-panel face frame element the canvas. The fasteners had caused slight deformations at their insertion point; our conservators determined these deformations were inherent to the construction technique of the artist, and would remain present post-treatment. The painting appeared to be primed white by the artist, and the paint layer was characteristic of thinly applied oil. The painting was unsigned, and appeared to be unvarnished. The piece exhibited accretions throughout, and was covered in a moderate to light layer of surface grime. The artist-made slat frame exhibited abrasions and scratches throughout; the scratches and abrasions were most noticeable at the corners of the piece. The frame was attached to the strainer using dome-headed brass screws, and the frame was decoratively painted using what appeared to be enamel paints. The frame exhibited accretions and finger marks throughout, and the glass panels were covered in a layer of surface grime and accretions. The neon component read “Mess is Less” in cursive font, and was fabricated of clear 9mm glass tubing. The gas fill was neon red, and the neon component hung over the top of the piece. The neon exhibited a minor break to the letter “M”, with additional breaks in the tubing between this letter and the electrode. Both electrodes exhibited some aging. The paper components of the piece exhibited moderate distortion and age-related discoloration throughout. The paper pieces also exhibited a moderate layer of surface grime. The first phase of this collaborative repair began with our Painting Department. After all the electric components were safely uninstalled, our conservators surface cleaned the painting to remove grime. Next, the reverse of the painting was cleaned using a soft brush and light suction into a HEPA vacuum. Lastly, the accretions were reduced. Next, our Paper Department began their phase of the treatment. After the sheets were removed from the frame, they were carefully surface cleaned using the appropriate conservation methods. The sheets were then passively humidified in a Gortex package, then dried between cotton blotters under weights. Lastly, our conservators treated the sheets with a deacidification spray. Meanwhile, our neon specialist was hard at work with his portion of the project. The existing glass was cleaned and flushed, then a glass pattern was drawn by tracing the existing glass and adding in the missing sections. Compatible glass was located, and the missing sections of the glass were formed. Electrodes were added, and the piece was reprocessed. After the paper sheets were reinstalled into the frame, the neon component was remounted to the piece. An acid free coroplast backing board was attached to the reverse to provide additional protection, and new hanging hardware was added. The piece will also be shown at The Center’s educational EXPO booth this year. The booth allows EXPO attendees to learn about the restoration process and see firsthand the treatments conducted for this exceptional work.